Breaking in my tri bike at the time trial did wonders for easing the tension towards my first triathlon of the season. Nonetheless I woke up at roughly 3:45 and wondered if by any chance tornado-type conditions could come along again and postpone the race like last year. Unfortunately James rolled up in the man van a few minutes early and I was scrambling to piece together all the gear I procrastinated packing. Luckily we got to the shores of Belews Lake with plenty of time to make some last minute adjustments, check in, and go on a nice warm up run. 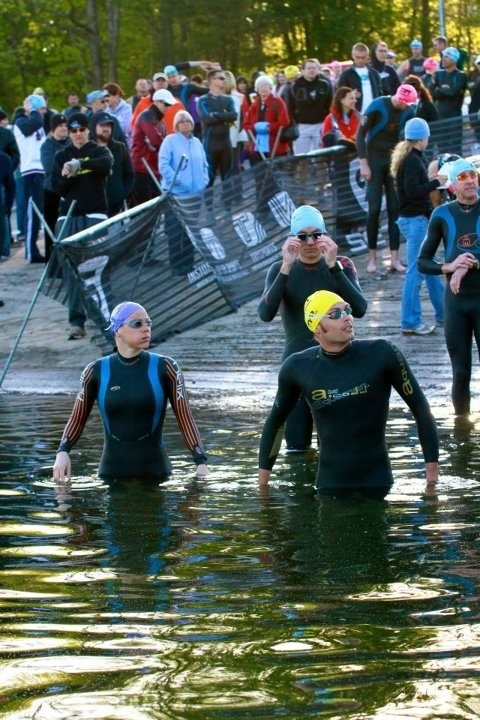 Excited to race in my new Blueseventy Helix, I got to the water early to splash around and line up for the time trial start. My anxiety about the race had all but subsided and I was ready to give the race a go. I entered the race with a pretty fast 100yd time so I was seated first to start with the faster Matt Wistoff. I hoped to at least jump of his feet but I was not holding my breath. 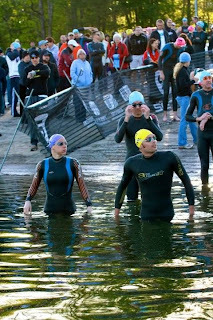 The start of the race was rather uneventful but Matt took off like a rocket and I simply paced my way to the first buoy. About half-way through the 1500m I noticed a guy passing me way off to my left. He was moving pretty fast so I figured he was that Olympic level Auburn swimmer I kept hearing rumors about. I just put my head back down and continued to pick up speed towards the finish. No one else passed me so I felt ok about my super speedy seed time. I am fairly certain the swim was a minute (or even two) short. I feel like there should have been one more turn buoy before the exit or the marker buoys should have been more at an angle. Basically if you followed the marker buoys instead of sighting the orange man at the end you simply opted to swim more. True story. T1: The Helix was very easy to pull off and I had half of it off before I even hit transition. In transition I did the unthinkable and sat down to pull off the legs. I do not think it hurt me any as I was right there next to my cycling shoes. Some people frown on the seated transition but it worked for me this time. I headed out on the bike and was happy to have my powermeter to keep my effort in check. The first 5 miles were against the wind and slightly uphill. I was working hard but my speed did not show it. Later on the back half I made up most of my speed with the help of a tailwind and long downhill. Those first 5 miles were definitely the toughest for me. My average speed was slow and my legs were already burning. I tried not to let the thought creep into my head that I was not ready to race. It has been taking me longer and longer to warm up, especially on the bike, so I successfully convinced myself to hold off all judgments until I passed the 30 minute mark. Luckily that worked and by the second loop I was feeling much much better. Rolling past the 15 mile marker I did a mock sprint finish and fist pump since HaycraftGTWD bet me he would catch me by then. He did not catch until 17.74 miles. Must have been my faster T1. T2: Ummmmmm where did my race belt and number go? #2 who do you work for? I heard a lot of people say they thought the run was flat. Looking back at the website it clearly says “no major hills.” I think we all might beg to differ. I remember from the sprint some significant hills and I was not looking forward to running them twice on the two loop course. Coming in off the bike, we exited the transition out the back and the volunteers were very good at directing us this way. The course proceeds up the short but steep hill before settling into a slight incline. I took the left to the out-and-back-loop portion and was immediately greeted with very excited cheers from the volunteer. Apparently “#2” was her favorite number and she was very excited to see me. Her enthusiasm made me smile and I settled into the relief of the downhill. The out-back-out-back course was perfect for keeping an eye on the competition and for cheering for my teammates. Rounding the last turn I knew I only had one more hill to make it up before it was downhill to the finish. I was happy to hold on to my position firmly throughout the run. Good start but I gots me some work to do!